Social service requires fortit­ude and selflessness in equal mea­­sure. These attributes Patk­uri Basanth Reddy possesses in abundance, for his qualities were forged in the painstaking journey of becoming a ‘saviour’ from being a ‘victim’. Once a migrant cons-tr­uction labourer in the Gulf, today Reddy is often a ray of hope for hundr­eds of workers in West Asia—in Saudi Arabia, Oman, Qatar and Abu Dhabi. A farmer’s son in Manoharabad village in Telangana, Basanth Reddy was compe­lled to sign up as a cons­truction worker. “My family was in dis­­t­­r­ess. My debt-ridden parents struggled to sell whatever they could produce on their small holding to feed me and my two bro­­thers. The poverty was unbearable. Those days there were agencies who recr­u­ited construction labour for Gulf countries. I borrowed Rs 70,000 and paid an agent, who sent me to Bahrain,” he recalls. Construction workers in the Gulf face hazardous working conditions, res­u­lting in a high number of casualties. Nei­t­her the company nor the country cares. It did not take long for Reddy to witness one death a day on an average. The death of his fellow villager Ranadheer Mera, who succumbed to his injuries due to lack of timely medical help, emotionally stirred him into action. “What if it’s me?” Reddy remembers asking himself repeatedly. Reddy raised money from fellow workers and, with the help of the Indian consulate, airlifted Ranadheer’s body back home. spe­a­king labourers from Andhra and Tel­­a­­­­­ngana, a spirit of helping each other in times of need grew stronger in the presence of Reddy. Even after returning home, Basanth Reddy didn’t forget the needy labourers in the Gulf. On many occasions, he spent his own savings. Basanth Reddy, who migrated to Bah­r­ain in 1996, returned in 2001-02 after rep­aying his loans. Back home, agriculture had revived, a real-estate boom hel­ped one brother become a property developer, the younger brother became village sarpanch. But through this turn in his fortunes, Reddy continued his ‘miss­ion’ to serve construction workers in dis­­tress, often flying to the Gulf, and being recognised as the go-to man for charity work. “During the last 15- 16 years, I have spent a few lakhs from my own earnings for bringing back the dead,” says Reddy, who recently launched the Telangana Gulf Welfare and Cultural Association. Take the case of Ch Muthanna, a Gulf migrant who returned recently to his home in Komm­a­npally village amid scenes of joy. Mut­­h­anna had gone to Kuwait eight months ago in sea­rch of employment, but was duped by his travel agent. Reduced to penury, he developed a kidney ailment. As a last resort, Muthanna appro­ached Basanth Reddy, who approa­c­hed the Kuwait embassy and arranged his safe homecoming. Also rec­ently, with the help of the MEA and Telangana Minister K.T. Rama Rao, Reddy had arr­anged the return of over 30 mig­rants who were stranded in Iran. There are many such tales of Reddy’s dev­otion to his mission, and he was justly rewarded by the state government during the 2017 Independence Day celebrations at the Golconda Fort. He also won the B.R. Ambedkar Visishta Seva Pursakar, confe­rred on him by Union minister Ram Vilas Paswan. 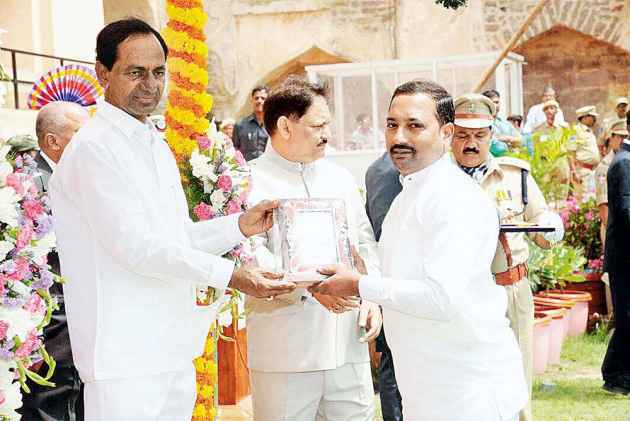 “Believe me”, he recalls, “I was taken aback when Paswanji wondered how such a prestigious award can be given to a non-Dalit.” But soon, organisers told Paswan of Reddy’s exemplary work. “Paswanji expressed his regrets,” says Reddy. There are over six lakh migr­ant workers from Telangana in the Gulf, he says with concern, and many who go there on fake (or kalivili) visas created by Gulf agents languish in foreign jails. Also, thousands of poor labourers who take loans from mon­­eylenders at high int­erest lead wre­t­ched, homeless lives when they find no work. Cast aside by employers, many con­template sui­­cide. Basanth Reddy has a plan for misguided, poverty-hounded youth who dream of the Gulf. “For respectable lives, youth sho­­uld attend skill development courses and obtain pro­­per qualifications before going to Gulf. I expect the state and Cen­tre to start more skill development institutes to train the poor so that they can hope for better offers.” Till then, for the unfortunate cast adrift in a harsh world, there is a saviour to call their own.